Sure, Washington’s 5-zip win against the Oilers was its sixth consecutive victory, but it was the first in the streak that wasn’t by a single goal. Which means the Caps won by just as many goals Wednesday as their five previous games combined. 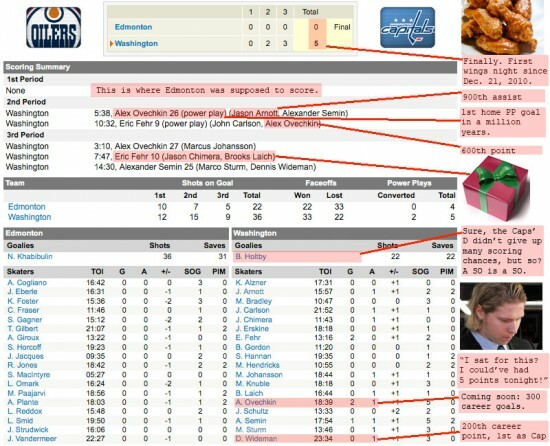 Click on the box score for a few tidbits of the game and lame jokes. Two screwups by me: Arnott’s was his 900th point, not assist and Wideman’s assist was his 2nd point with the Caps (it was Sturm that got his 1st point with the Caps last night).